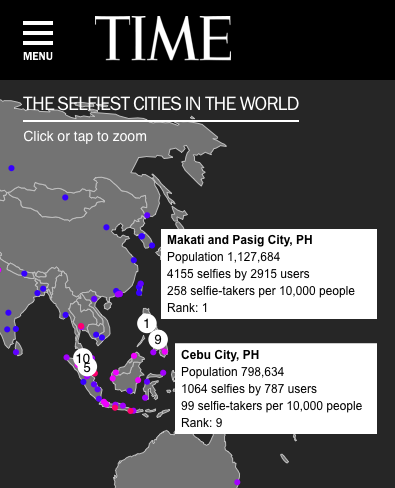 Time.com recently made a study declaring Makati-Pasig cities (as area) ‘Selfiest City of the World’ (slow clap) with Manhattan, NY a close second (Note: Selfie is a term used to do self portrait photograph using a smartphone or any device that has a camera in it). The news magazine did the survey recently in a period of 6-days (January-February) and 5 days (March) What Time.com didn’t reveal though was The Philippines actually hogged the first two spots of this top ten ranking. Why is our result different from theirs? First, their data didn’t make sense. I tried to compute Makati-Pasig’s selfies score of 4155 to either of the given variables of selfies vs: (a) population, (b) users, or (c) even per capita of 10,000 (vs. Population) and none of them showed the result of 258 so I wondered how they got that number. Second, I used a different method to calculate the data. Since the title is the “Selfiest Cities of the World”, I divided the number of selfies versus the number of Instagram users for each city to understand really how many selfie does one take to actually get that number and the result was much different. It came out that out of the Instagram users who took photos of themselves, used the hash tag “selfie”, that included the geo-tag city of that nation, Cebu actually came second. My per Capita, as shown, is based on the number of Selfies shot against the number of Users provided by the sample data time.com provided. This shows that Filipinos made 1.43 ‘selfie’ shots per Instagram user or 0.16 shots more than a Manhattan-resident. While the attention Philippines got was good, it’s really not nice to be called “Selfiest City of the World” because (for me) with it comes the tag “vainest city of the world” or the “the most narcissistic city of the world” (woohoo!) who love seeing themselves so much on cyber space. Yech! But more than the data sample, the result shows that The Philippines is fast catching up in the sphere of technology and I’ll be talking more of that in a blog I entitled, “What Selfiest City Means To The World of Social Media” and the gains we produced as a result of this study. Thank you for linking my blog to your post. Thanks. Thanks for sharing your thoughts on instagram online generator.